What is the abbreviation for Balloon Angioplasty vs ROtacs for total Chronic Coronary Occlusion trial? A: What does BAROCCO stand for? BAROCCO stands for "Balloon Angioplasty vs ROtacs for total Chronic Coronary Occlusion trial". A: How to abbreviate "Balloon Angioplasty vs ROtacs for total Chronic Coronary Occlusion trial"? "Balloon Angioplasty vs ROtacs for total Chronic Coronary Occlusion trial" can be abbreviated as BAROCCO. A: What is the meaning of BAROCCO abbreviation? 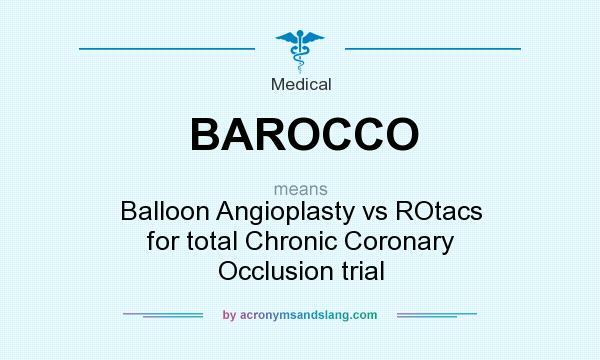 The meaning of BAROCCO abbreviation is "Balloon Angioplasty vs ROtacs for total Chronic Coronary Occlusion trial". A: What is BAROCCO abbreviation? One of the definitions of BAROCCO is "Balloon Angioplasty vs ROtacs for total Chronic Coronary Occlusion trial". A: What does BAROCCO mean? BAROCCO as abbreviation means "Balloon Angioplasty vs ROtacs for total Chronic Coronary Occlusion trial". A: What is shorthand of Balloon Angioplasty vs ROtacs for total Chronic Coronary Occlusion trial? The most common shorthand of "Balloon Angioplasty vs ROtacs for total Chronic Coronary Occlusion trial" is BAROCCO.